The fuel gauges in the Diamond are not very accurate. But the VM-1000 has a nice feature that, when properly initiated, will give you a very accurate reading. 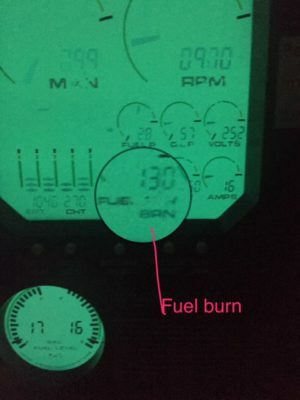 On a recent flight the difference between the fuel burn as computed by the VM-1000 and the fuel added from the pump was only about 1/2 gallon. The fuel gauges, on the other hand, indicated 5.5 (or more) gallons greater than the actual and computed. That’s significant. At the end of the flight, the gauges indicated that we had 17 (this could be 17 or more based on the functioning of the Diamond gauges) in the left tank and 15 in the right tank for a total of 32 (or more). The computed fuel remaining was 27.5. See two pictures below. In order to access this information, you simply press “button 4” (this is the fourth button over from the left). Pressing button 4 begins a cycle through some fuel pages that are all displayed on the Fuel Flow gauge (bottom left round “dial”). Fuel flow is the default mode but when you press button 4 it will display “REM” (for fuel remaining) displayed in gallons and tenths. Press it again and it shows “HRS” for hours remaining (based on current fuel flow). Press it again: “BRN” for fuel burned (since power up). The last button push displays “ADD” (for adding fuel). In order to use this feature you’ve got to tell the computer how much fuel you have to begin with. If the tanks are full it’s easy – 40 gallons. If you don’t know how much is in the tanks you really have to use the silly/messy manual fuel gauge for an accurate reading. But to make things easy, let’s assume your tanks are full. If the “REM” says 25, press button 4 until you get to “ADD”, then press button 3 to add 10 gallons; each press is 10 gallons. Now press button 5 (five times); each press is one gallon. [so, you’ve added 15 gallons to the existing 25 and now have full (40) tanks displayed.] If you needed to enter 24 gallons for example, you would first enter the 20 gallons with button 3 [twice] and then enter the 4 gallons by pressing button 5 [four times]. 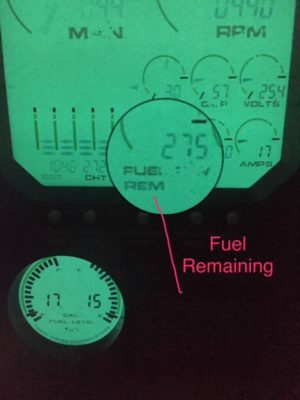 When you’re done – if you’re happy with what’s displayed, press button 4 again and your “new” fuel will be added to the original REM and should show the correct quantity now. Double check it by pressing 4 again until REM shows your actual fuel. If you make a mistake while entering the fuel quantity, no sweat… just leave everything alone for 20 seconds and it should cancel the “ADD” mode.